I may have discovered a previously unsuspected relationship between Late Iron Age hill forts, and an anti-predation strategy commonly employed by gazelles. This is, before we go any further, idle conjecture. On a windy walk this afternoon, my daughter and I were entertaining each other with the usual rudderless carousel of conversational whatness, when we happened upon the subject of stotting (or pronking) along the leg of the route that brought us within eyeshot of the local hill fort (King’s Castle Enclosures). The Enclosures have their origins in the Bronze Age, and probably weren’t occupied in the Late Iron Age, but the coincidence of its presence was enough to prime the pumps of the imagination. First though, perhaps a little more about stotting (or pronking). The etymology of the terms can be found here, but very briefly both words describe a boastful method of locomotion. The cheetah, lion, or leopard will go for the easier target, and the best pronker will live to pronk another day. I’m paraphrasing a little, but that’s roughly the gist of it. So, what does this have to do with hill forts? The tradition of defensive hill-top enclosures is not a simple one to interpret so, for the purposes of this post, I’ll be cutting a long story short, and painting in broad strokes (is that a mixed media metaphor?). If you’re interested in recovering any of the details which will inevitably fall out of the picture, they can be found at the bottom of the page, in the form of further reading recommendations. Put simply, hill forts began to appear in the late Bronze Age which, it is generally agreed, segues into the Early Iron Age at around the 800 BCE mark. These structures started as relatively small and simple affairs, usually consisting of a single circuit of defences (ramparts) with one or more entrances. In the Early Iron Age there was something of a boom in hill fort construction, the advent of which is often attributed to an intense phase of social reorganisation. Once society had finished reorganising itself, the majority of these hill forts were then abandoned, while a number were redesigned to a highly elaborate specification. These are known as ‘developed hill forts’, with Danebury, Maiden Castle and Cadbury Castle being among the best known examples. Danebury Hill fort, Hampshire. Image copyright Google/Get Mapping. These developed hill forts are characterised by a number of unique features, the most immediately obvious of which is the sheer scale of engineering. Everything has become more elaborate, and significantly larger. The area of enclosed land is greater, and instead of a single circuit of defences, the ramparts are now arranged in concentric rings (the technical term for this is multivalate). The ramparts have not only increased in number, but also in size. They are huge. After the scale of the defences has sunk in, your eye may then wander to the entrances. Early hill forts often had two and sometimes three entrances, which were more often than not quite straightforward efforts. They were created, quite simply, by leaving a gap in the defences. Conversely, a developed hill fort usually has only one entrance but the rampart terminals often overlap, and form strategic choke points and blind alleys, overlooked by fighting platforms. 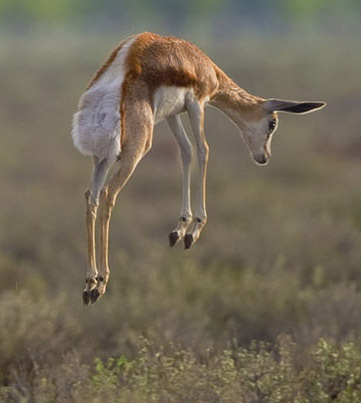 So what does this have to do with gazelles? 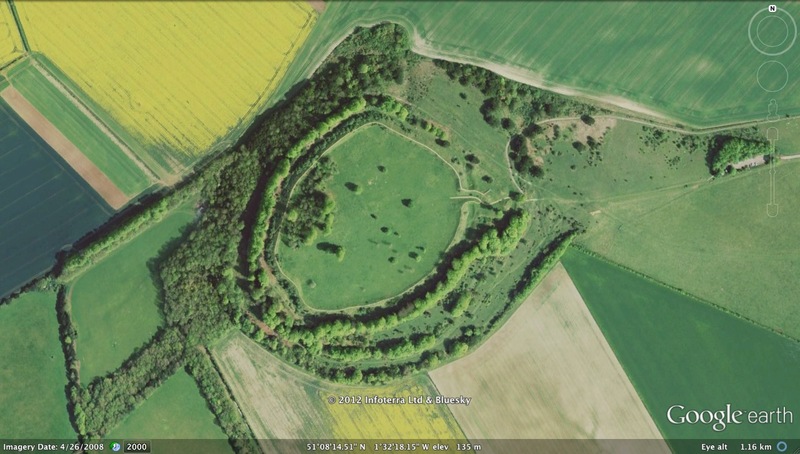 The thing is, from an engineering perspective, the improvements to the developed hill forts were often far more massive and elaborate than they needed to be – by an enormous degree. These structures are quite plainly intended to be the most obvious things for miles around. They were deliberately conspicuous. And a conspicuous display of strength, whether expressed by a gazelle or a hill fort, is never intended as an invitation to combat. It is intended to direct the attention of the potential attacker to alternative, less able targets. In this respect, a developed hill fort is nothing more than a pronk, rendered in soil, timber and stone. I think this idea has been around for a bit but I’ve never seen the gazelle analogy before :-) Have also heard the argument that there was an element of ‘Keeping up with the Jones’ to their design. In other words, a sort of hill-fort fashion thing, with designs being copied and adopted as much to show status as to be genuinely defensive.